When you take up swimming, there is some swimming equipment you might want to consider. Below we will list the essentials, as well as some additional equipment that can make your task easier. To get started, you will obviously need a good swimsuit. For men, these are usually swim briefs, swim trunks or jammers. Boardshorts aren’t recommended for swimming as they create too much drag. Furthermore, they are forbidden in certain pools for sanitary reasons. For women, the best choice for swimming is the one-piece swimsuit. As for the brand and material, I can recommend Speedo Endurance swimsuits. They come at a reasonable price and I have been using them for years. The material is designed for people who swim several times per week. It is durable and resists the chlorine well. A swim cap is often mandatory when swimming in a public pool, unless you are bald. A swim cap also comes in handy if you have long hair and want to avoid that it gets into your face while swimming. 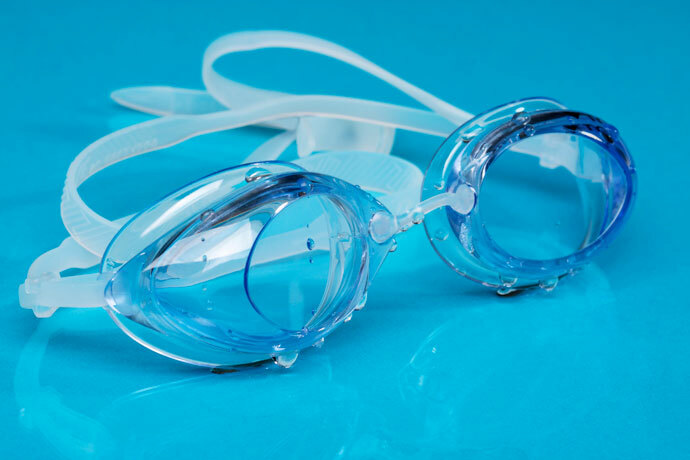 A good pair of swimming goggles is also must if you are serious about learning to swim. 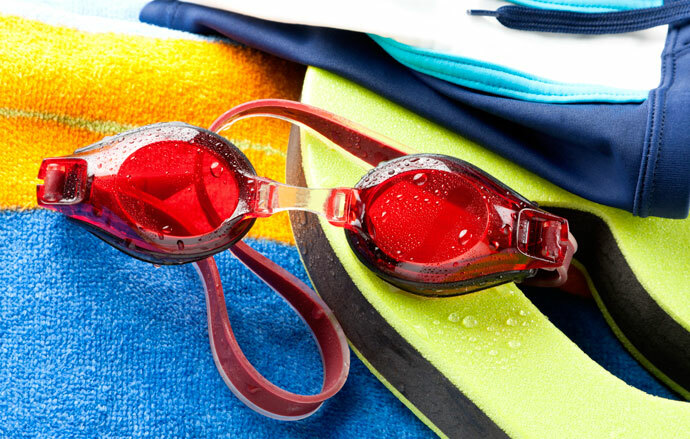 Swimming goggles allow you to submerge your head without having to fear of getting water in your eyes. You will be more relaxed and able to streamline your body better. A nose clip is nice to have, as it keeps water out of your nose. So it’s one thing less to worry about during the initial learning phase. A nose clip helps especially while learning front crawl, as it takes quite a bit of technique and coordination to be able to breathe on the side and keep your arms and legs moving. 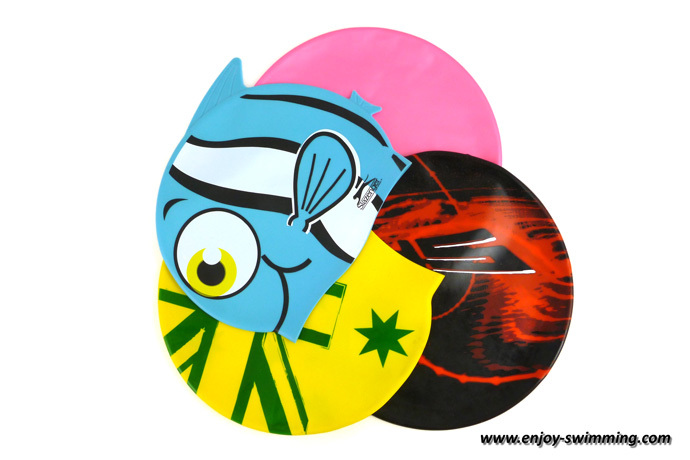 Swim fins dramatically improve the efficiency of your flutter kick in front crawl and backstroke and the efficiency of your dolphin kick in the butterfly stroke. The legs are much better supported in the water, and hence you can focus on learning the arm stroke movements. 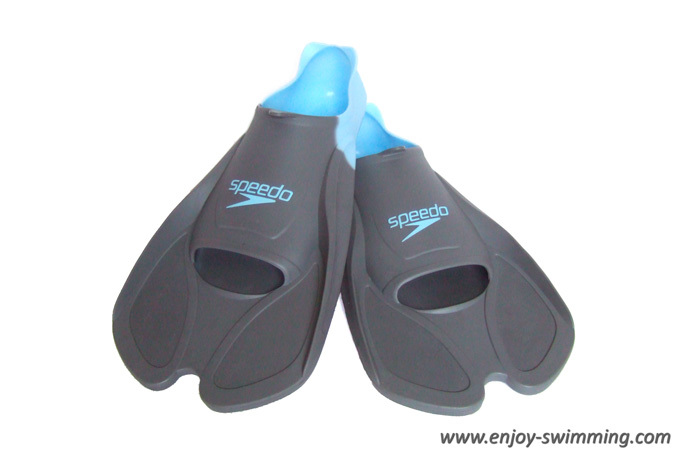 My preference goes to the shorter types of swim fins, like Zoomers or the Speedo Biofuse, as they put less strain on the Achilles Tendon. 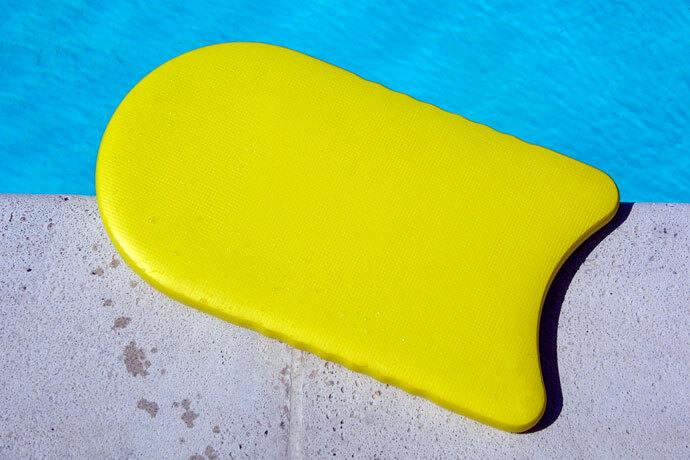 The pull buoys is a figure-eight shaped flotation device made of solid foam and which you squeeze between your thighs. A pull buoy also supports your legs so you can focus on the arm stroke movements. 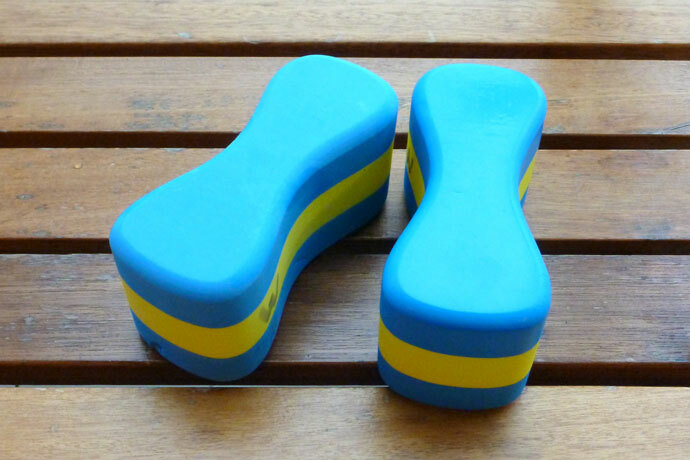 It makes the most sense to use them when swimming front crawl. However, you should take care not to become dependent on them, as they can mask balance problems. 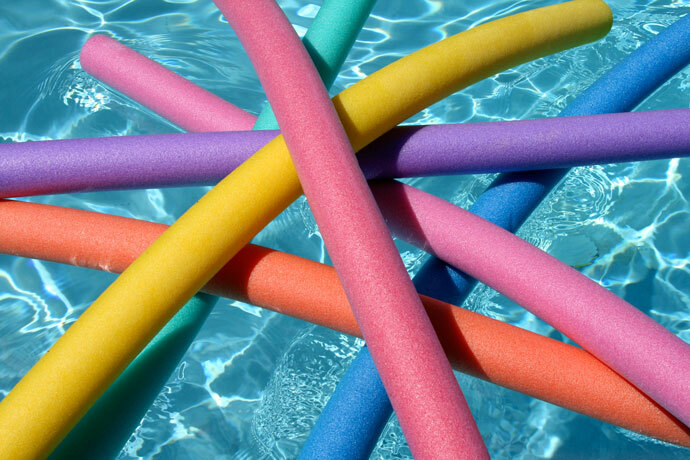 Swimming noodles (also called water noodles) are those long colored flexible cylinders made of solid foam. Children like them a lot, as they are great pool toys. But they can also be used as flotation devices to support the upper body while learning the leg movements of the different swimming strokes. A kickboard can be used to isolate and learn the leg movements, especially the flutter kick and the breaststroke kick. A kickboard makes less sense to learn the dolphin kick used in butterfly, as the kickboard limits the body undulation that is essential in that stroke. Please note that holding the kickboard in front of you at arm’s length while flutter kicking can put some strain on your shoulders. Using a swimming noodle across your chest can be a valid alternative for those kinds of exercises. On this page, we have covered what I consider the most useful swimming equipment you can use as a beginner. There’s a lot of additional gear available, but as a beginner, you will go a long way with what is listed above. I am in a beginner swimming class. I don’t want to wear a cap and goggles when I am swimming. Please suggest me the disadvantages of doing this. 1) A swim cap protects your hair from the chlorine. It also keeps your hair out of your eyes if you have somewhat longer hair. Finally, it is mandatory in many public swimming pools for hygiene reasons. 2) Swim goggles protect your eyes from the water. They also increase comfort and can help you to be more relaxed as you can open your eyes and see in the water. This is a factor you shouldn’t underestimate, especially if you are learning to swim. I think everyone who is serious about swimming should use swimming goggles. I noticed that some swimmers use ear plugs. Why is this?